The work presented on these pages originally grew out of a desire to impress myself and others by carving tricky objects in wood - tricky in the sense that the piece is cut into parts that are loose, yet cannot be taken apart. This is not a new idea. I have read that it has been a popular pastime among american cowboys to whittle sticks into chains when sitting around the camp fire. The chinese have carved nested spheres out of ivory, simple in geometry but often exquisitely delicate in details. 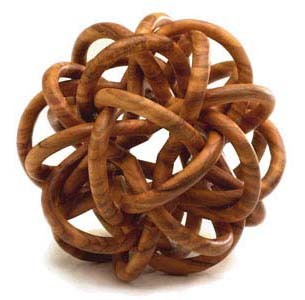 My own first attempts were of course very simple, but soon my interest turned more and more towards the development of new and more complex models, which has led to a preoccupation with subjects like geometry, topology, knot theory and symmetry. You'll find the fruits of my efforts on these pages. Most of my works, like the one shown here, are not suitable for pocket use. I coined the phrase Pocket Art (or the Danish equivalent) when I attempted selling some of my Wonder balls and Hopf links that are ideal pocket items. Later I discovered that the phrase is being used elsewhere, perhaps with slightly different connotations, such as ball pens with decorated top. I stick to the term because (at least in Danish) it has the added connotation, which I like, that the Art part is not to be taken too seriously.